Also published in the US as "Golden: Sweet & Savory Baked Delights from the Ovens of London's Honey & Co." (2016). You can tell a good cookbook by judging how quickly you make a recipe from it. I read this recipe & was instantly transported to the kitchen. I will make the disclaimer that I only had a few stray blood oranges that were at the end of their season, but this marmalade is exquisite & I can't envisage that a difference in orange variety would detract from that. I made these based on the last review and I can confirm they are delicious. Just like something from an upmarket bakery. They are a bit fiddly but definitely worth the effort. This tastes amazing and is worth the price of the book alone! This was super easy and really tasty, I just added a few tsps of chilli flakes. These are delicious and pretty easy to make if your dough has been made in advance. Absolutely delicious. Great on their own or with cheese. A great gift. Very disappointing. This turned out to be a tacky, overly sweet mess. My bars look nothing like the ones pictured. I used rolled oats, like the recipe requires, but the pictures look like the oats were finer than mine. In any case, the texture was all wrong. Gloopy and oily. The taste wasn't so good. My four year old said it was "too sweet" and refused to eat it. I think a tiny bit of salt would have balanced the flavors more but I don't think I'll try this recipe again. In fact, I suspect that I'll have to throw most of the bars out, as nobody in my house wants to eat them. This is delicious with butter and marmalade. I was a bit concerned that it would be too sweet when I was making it but the end result was perfect. The spices are really lovely and the texture is perfect. This loaf was the reason I bought this cookbook. 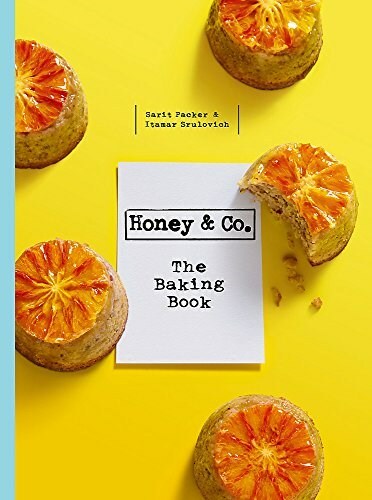 I tried it when I went to Honey & Co and immediately decided I must buy the baking cookbook. The recipe did not disappoint. Even though it requires a little extra effort to make the sweet spice mix and I originally had trouble finding Mahleb the fresh spice mix is totally worth it. Since looking for Mahleb I have noticed it in many delis and Lebanese grocers in Melbourne, both whole and already ground, so it can be found! This is really a tasty and different loaf that will impress your friends. Used half of a batch of dough, used the other dough for the chocolate bread which was delicious. Expectations were therefore high for these roses. I used whole poppy seeds instead of ground because I didn't have a mortar and pestle. Probably that's why the filling was to wet. I didn't add the egg that was in the recipe. Probably I didn't follow the recipe enough, will try again! Does not require too much work, and was delicious. Since it was chilly, I let the dough prove much longer than was recommended. Came out wonderful and airy. This is just okay. It was a bit too moist/oily for my taste and there is a ton of sugar in this. I think I wanted something more cake-like in texture. My kids, of course, ate it without complaint. Tastes better after a week or so. This cake is not pretty but it is delicious. The spice mixture really complements the squash, pecans and currants. I turned the heat down to 350 after the first 35 minutes because it was getting so dark and it was perfect after another 25 minutes. I can't wait to have a piece with my coffee tomorrow morning! This is a nice zucchini bread. My kids loved it. I baked it at 375 for 55 minutes and another 5 minutes at 350 to make sure it was cooked through. After I was done I realized that I forgot the granulated sugar and just used the brown and the sweetness is just right. I will probably make it like this again, as some of the cakes in this book are a bit too sweet for me. This is a very very good cake! I love the unusual flavors. The ginger and star anise is subtle yet noticeable (even more so on the next day). I found the cake a bit too sweet, so I’ll experiment with reducing the sugar by 50 - 100 grams next time. I veganised this recipe, added 2tbsp ground flaxseed in 6tbsp warm water( let it thicken) dough was a quite dry so added a couple of splashes of coconut milk. It did take longer then the allocated time, it did sink a little. However it was very tasty, quite an unusual flavour, will be baking this again. This was easy to mix together and it's very good. It took about 70 minutes before the inside was fully baked. The flavor of this cake is really delicious, but I had trouble with the baking -- after well over the specified baking time, the very middle of the loaf was still not fully cooked. I finally pulled it out and it sunk in the middle. Unsurprisingly, the edges were dry and overcooked. It seemed to me like the pan might be too small for the amount of batter -- may try again in a 9x5 pan, or just a square baking pan. This is an unique and tasty little cake. I made one cake in a standard loaf pan and it took 60-65 minutes before it was done in the middle. The loaf has a nice texture and the fennel seeds and peaches give it a lovely flavor. These are absolutely delicious and I would highly recommend baking them. Mine were in the oven about a minute too long although still make delicious cookies. I have frozen half the batch I made to be baked at a later date. This cake is absolutely fantastic. I had all the ingredients on hand. Made for desert to take to friends. What a hit. I bought organic coconut flakes to garnish. ...this book is a bargain in terms of content, it has almost 150 recipes...divided up in chapters by time of day...international, with an emphasis on Middle Eastern and Israeli baking.